We bought a new washer the weekend before last and it was delivered and installed last Friday! It’s a Samsung Top Loader. We have a subscription to Consumer Reports and read several reviews. 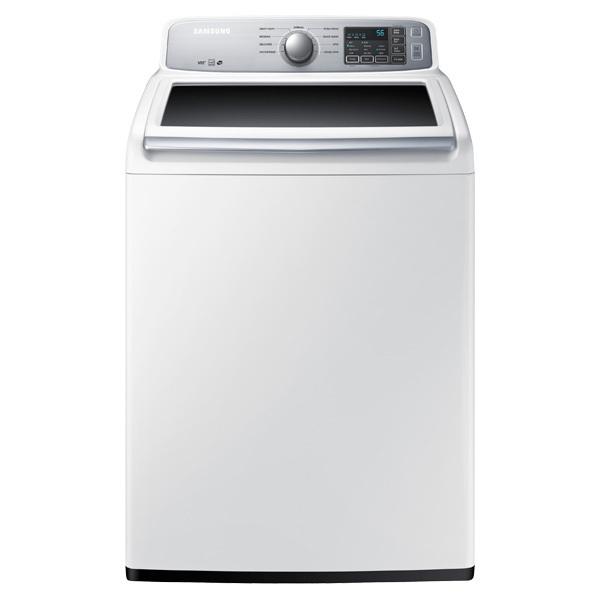 The Samsung washers had a good rating and this one was within our price range. We purchased it from Warners’ Stellian. Our sales person was super nice, helpful and not pushy at all. I like that. When we started giving her our information she and Nolan realized they went to high school together. Go Mustangs! Our old washer was one my in-laws purchased back in 1993, so it was at least 23 years old. It would get to the spin cycle, but not actually spin. So, 3-4 times per load, you’d have to go back downstairs and restart it. If you weren’t punctual you’d get to wash the entire load again because the water would get stagnant. The dryer is as old, but is still working just fine. We air dry or dry clean our nice clothes, so the dryer mostly sees workout clothes, socks, towels, sheets, and whitey tighties. No fancy drying cycles needed. Nolan wanted a top loader because he is old and bending over is hard. JUST KIDDING- We all know that I do all the laundry around here. 🙂 Really though, top loaders have shorter wash cycles and are less expensive, plus you don’t have to buy that extra pedestal piece, which can run you an extra $200-300 per appliance! And let’s face it; I’m cheap, I mean, frugal. If you were stuck on a front loader you could build your own pedestals or if you’re confident it won’t leak you can build cabinetry around and install crazy chunky crown molding. 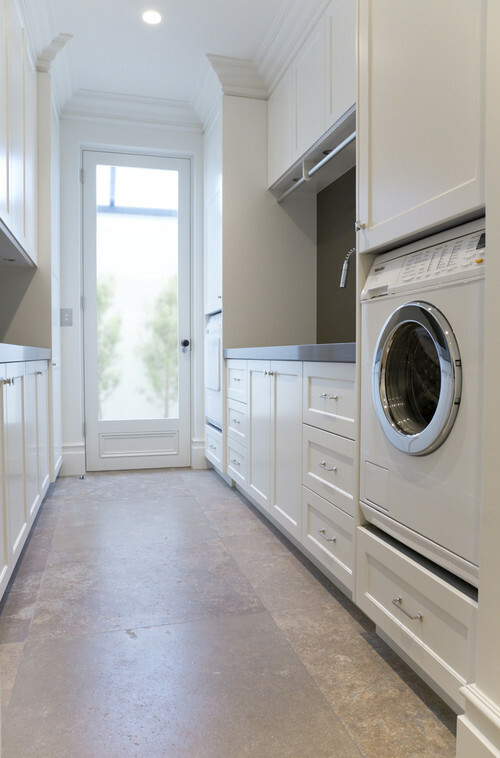 Having a front loader does give you counter space, but our laundry room is a typical basement laundry room. The room houses the furnace, air filter, water heater, water softener, a laundry tub and all the pipes for the sprinklers, soooo having a nice counter wouldn’t convince me to stay down there any longer than I have to, unless we installed a wine fridge next to it. Then I’d be “doing laundry” all the time. 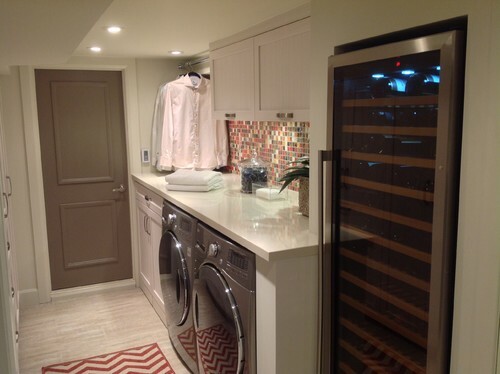 Both laundry room images from Houzz. SO WEIRD GF! Mine stopped spinning two days ago, so yesterday I replaced the broken motor coupler, but now the cold water won’t turn on for the spin cycle. What the heck! Ours is probably only 4-7yrs old, so I’ll give that another go with the tool box and the googles. Glad yours is squared away! LOL @ Nolan is old, j/k b/c the laundry is all you!